Adelaide Band 737 is a high energy party band. Playing the songs that you want to hear, that we know everyone will know and enjoy. Our standard line up is a 4 piece featuring vocals, sax, semi-acoustic guitar and drums / percussion. We like to call this the ‘Adelaide Band 737 Acoustic Party’. We can also add other musicians to the line-up, depending on the performance. This could be a 5 piece with a keyboard or a bass player joining us. Or maybe a bigger band, bigger sound is needed so we’ll add keys, bass, an extra vocals, an extra sax etc. Or we can perform as a 3 piece (vocals, sax, guitar) if you are looking for some cool background music. Adelaide Band 737 has a unique blend of experienced musicians combining with some up and coming stars. Adelaide Band 737 is suited to all types of performances. 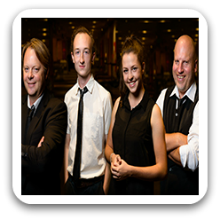 From corporate events through to festivals, from 18th birthdays through to weddings, background music during dinners through to party music to end the night. 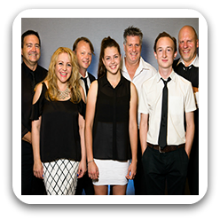 Can perform as a: 3, 4, 5, 6, 7, 8, 9, 10 Piece Band and are available to perform in Adelaide and Surrounding Areas. We had band 737 play at our conference dinner at the Stamford Grand, Glenelg. The 5 piece band was amazing we had the best night with them! So far in all the conference bands I have booked in the last 4 years….these guys were the best. Our next conference is at the Gold Coast…I wish we could have them play again for us. Highly recommend….you wont leave the dance floor!